Imagine this: You just went through the emotional and physical hell of breast cancer treatment for months – maybe even longer. You suffered through chemo and lost your hair, changed your schedule and diet, did research, struggled to cope with your emotions and other people’s too, and possibly went into debt. Like the three million women who survived breast cancer before you, you’re all too familiar with difficult health care choices. 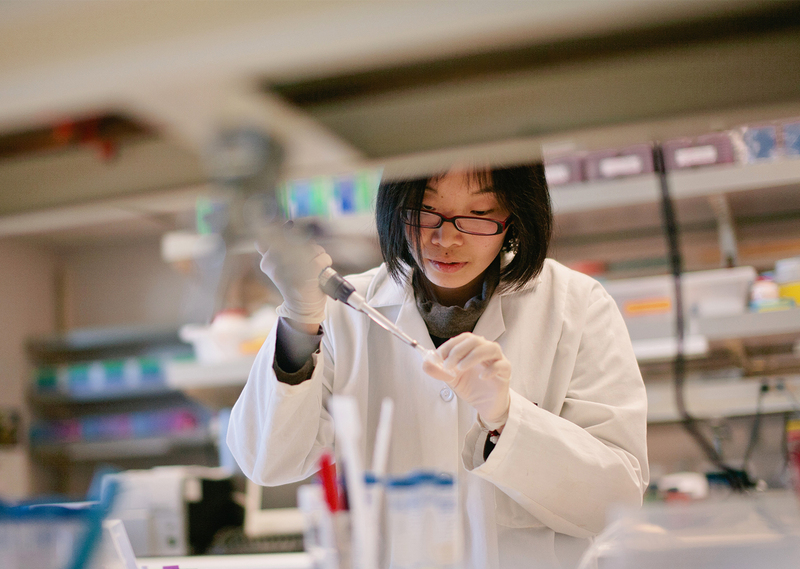 In the face of a high risk of recurrence, over the next five years you’re willing to go through a lot to make sure that if the cancer returns, you detect it early. Recently, more women and doctors are adding MRIs to the usual mammography as part of post-treatment monitoring, but should you? Extra tests can be inconvenient, expensive, and create anguish when false detections take time and work to resolve. You may even end up treating something that never would have caused a problem for you. You’re emotionally and physically exhausted and there’s little information available to help you make this decision. This is the challenge Group Health Research Institute (GHRI) set out to address with their SIMBA study (Surveillance Imaging Modalities for Breast Cancer Assessment). 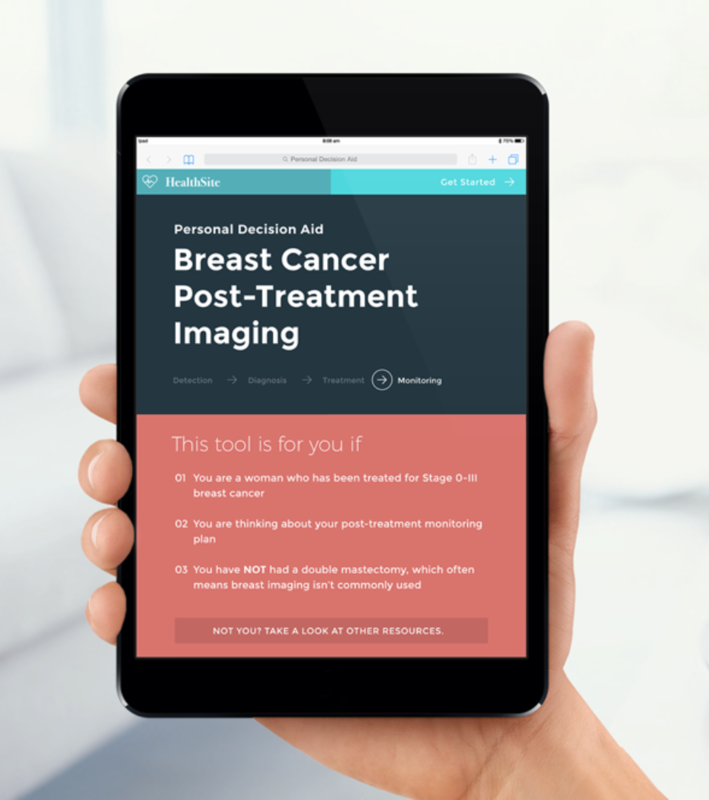 Conducted between 2013 and 2016, the study goals were to conduct the largest-ever analysis of the effectiveness of mammography and breast MRI, then use the data to empower patients to select the right imaging solution. They gathered perspectives of patients and doctors, then began the analysis with 36,000 breast cancer exams. 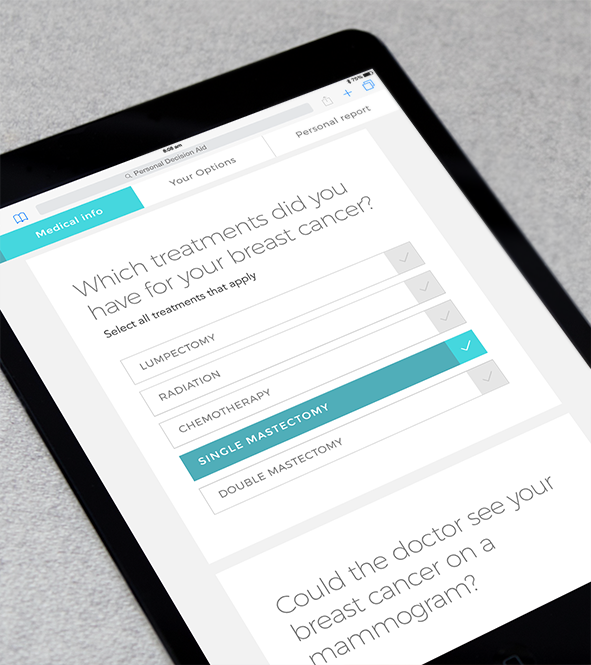 Early in 2016 they approached Artefact to design a decision aid that could help breast cancer patients understand and discuss their monitoring options. The SIMBA decision aid is designed for stage 0-III breast cancer patients who have not had double mastectomies, to help them learn the facts about mammograms and breast MRIs, receive personalized risks and benefit information based on imaging results from thousands of other women, and understand which option is more aligned with the things they care about. Today, there is no other place for women to get comprehensive information on this issue while reflecting on personal impact. The app walks women through what it’s like to experience each type of imaging, along with stories from women who have been through this decision, and provides a comparison of the various risks and benefits. Women are encouraged to reflect on what matters most to them (e.g., physical discomfort, health risks, cost), and note questions and concerns they’d like to share with their care team. Patients told us that personalization made the decision aid more valuable and interesting than any other resource. The personal report is tailored to each user’s unique medical history, and powered by GHRI’s data analysis. Each woman receives her own numerical, text, and pictograph descriptions of how often cancer will be correctly and incorrectly detected or missed with each type of imaging. The report highlights factors that are personally important, as well as the option she currently favors. As a woman goes through the decision aid, she is prompted with questions to capture her values. Prompts ask for her current stance, then the factors she finds most important (e.g., avoiding false detections, health risks of the procedure, cost, duration). We designed these prompts to encourage reflection on each topic and capture data that can be included in the personal report in order to guide discussions with family members and doctors. We know that small design decisions – like the order in which information is presented or the type of visualization used – have the potential to unintentionally bias women toward one option over another. To reduce bias in our design, we consulted behavioral economics, cognitive psychology and human-computer interaction literature on factors known to influence decision-making and risk perception. Communicating complex medical information to a wide audience can be especially challenging. Working with a plain language expert from GHRI, we carefully reviewed language we used to ensure that women would be able to easily understand the information regardless of their level of education or English proficiency. To improve readability, we organized the information by topic using a “card metaphor” and used large headers to help orient the patient in the tool. 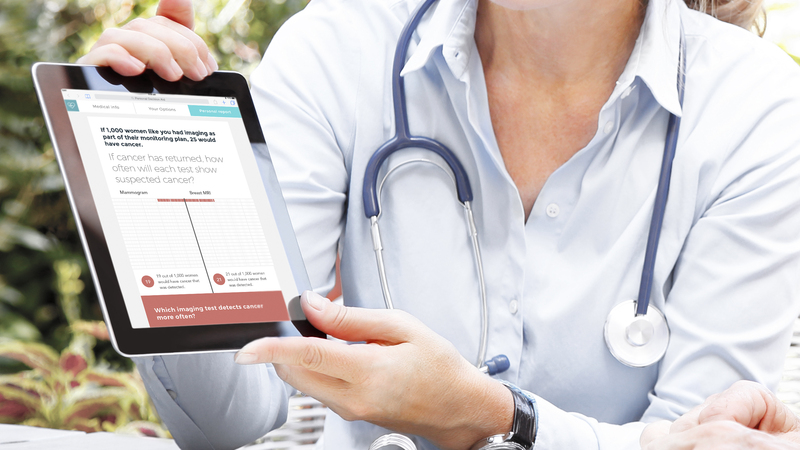 Our tablet-first and mobile-friendly design makes it easy to share the report during a conversation with a doctor. Most existing online decision aids are not easy to take with you to a doctor’s appointment, but research shows that older women are adopting tablets faster than smartphones or laptops. Rather than a tool for making a final decision, the SIMBA decision aid was designed to be part of a larger, shared decision-making process. 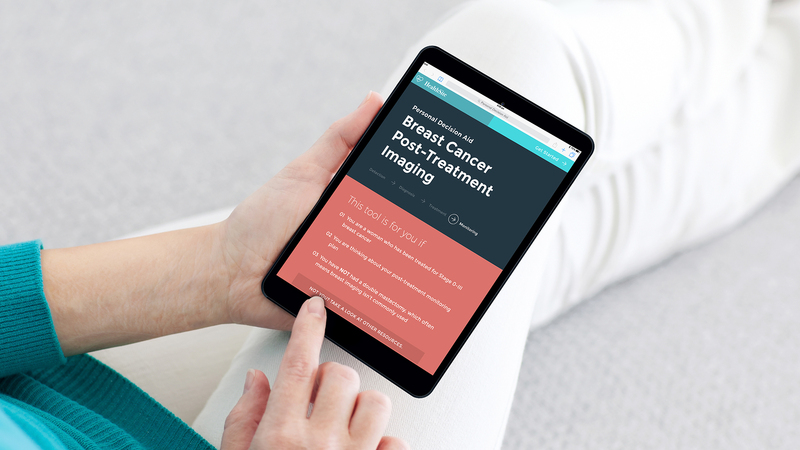 Breast cancer patients can use the site to develop an informed preference, and then talk to their doctors and family members about which way they’re leaning. Features like mobile optimization, printing, and emailing ensure the personal report can easily be brought to the doctor’s office. The report highlights questions the patient has for her doctor, as well as her self-reported priorities, to help guide the conversation.